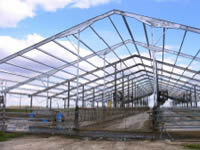 Building a structure of any size requires planing, building dairies requires engineering. Our crews build the finest dairies in the world, and we have been doing so for some time. We have included the world class engineers from Five-G Consulting as members of our dedicated and skilled team. To learn more about Five-G Consulting, visit their website at, www.FiveG.com.